Notes: Weighing 200-250 lbs. This is the finest and most spectacular specimen of gem Chrysocolla ever found at the Ray Mine in Arizona, which was world famous for some of the finest gem chrysocolla specimens in the world. 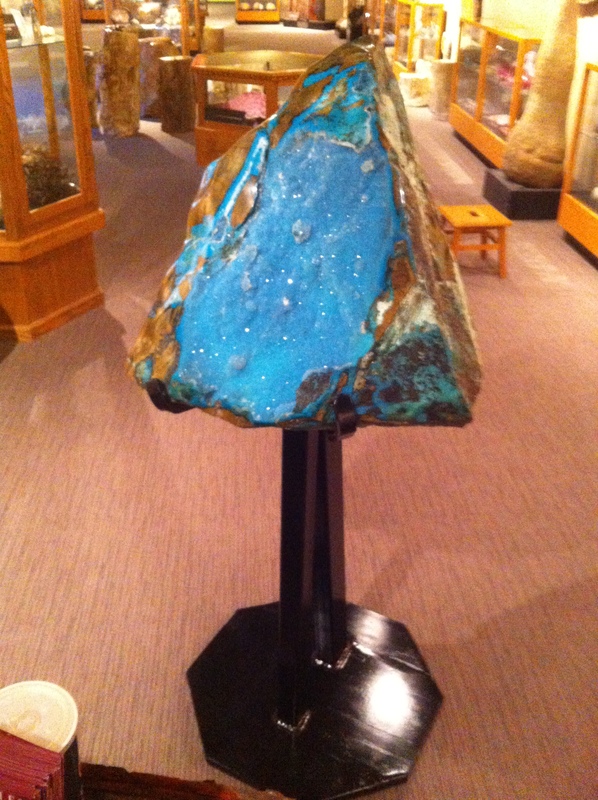 Gem Chrysocolla is in the same family as turquoise. There is a clear coating of hundreds of tiny glass clear quartz crystals covering the blue green chrysocolla which gives a luster and visual brilliance to the piece. Recently there was a large avalanche that destroyed the entrance to the mine and it is not anticipated that there will be any more specimens coming from this location. The crystal formation is considered one of the two greatest specimens of druzy (covered with tiny quartz crystals) Chrysocolla ever discovered anywhere in the world and is a major world class treasure.